A RING MADE JUST FOR YOU! 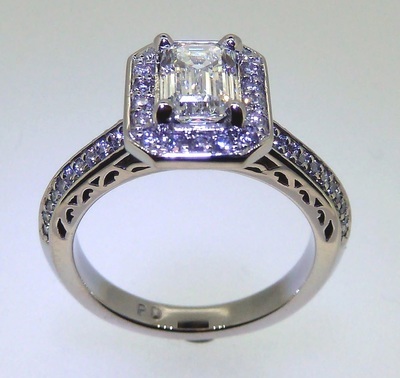 ​The Diamond Specialists, Inc. is the premier Custom Jewelry Designer and Manufacturer in Hawaii with thousands of happy customers and beautiful pieces made since 1986. The quality of our work is among the finest in the nation. We use diamond melee with the finest proportions cut by one of the top diamond manufacturers in the world. The melee from this manufacturer is known for its brilliance and are found in jewelry pieces sold by famous diamond houses in Europe, Asia and the U.S. They manufacture diamond melee with the best proportions down to 0.003 ct in size. That is simply remarkable! Our manufacturing jewelers are among the best in the nation as their CAD/CAM, casting, finishing and setting skills are unsurpassed. The channel setting is clean; the pave setting is brilliant. Boutique jewelers in Beverly Hills, Fifth Avenue and other areas throughout the country use this manufacturer because their work is simply outstanding. You can click here to view a gallery of some of our custom designed and manufactured jewelry pieces or use the link at the bottom of this page. Or you can click to find tips on identifying and avoiding flawed jewelry or use the alternate link at the bottom of this page. You may make adjustments or modifications to any existing design to account for your ring size, center diamond size or your design preferences. You may choose the specific quality, size, shape, and number of diamonds and total carat weight of diamonds or colored stones. You may choose to have your piece done in Platinum, Gold or Palladium. If you choose Gold, then you can choose 24K, 22K, 18K, 14K or 10K in yellow, white, rose or green gold. In creating your jewelry piece we can take into account your preferences for the thickness, width or height of the ring, make adjustments for your finger size, the size of the center stone, or any other concern that you may have. You do not have to compromise and accept pieces that were mass produced for a generic customer. If you are interested in obtaining a quote to start the process, then bring in a picture, a sketch or your ideas. If you need ideas to get you started we have a selection of books and magazines to get those creative juices flowing. Once we have a clear idea of your design a wax model will be created using state of the art CAD/CAM technology. This will be a three dimensional, actual size rendition of your piece. At this stage you can make adjustments in height, width or thickness. When the wax is completed to your satisfaction it is then cast in the metal of your choice. Your piece is then cleaned, set and polished and presented to you in all its resplendent glory. Satisfaction is guaranteed! Come in for a free quote.